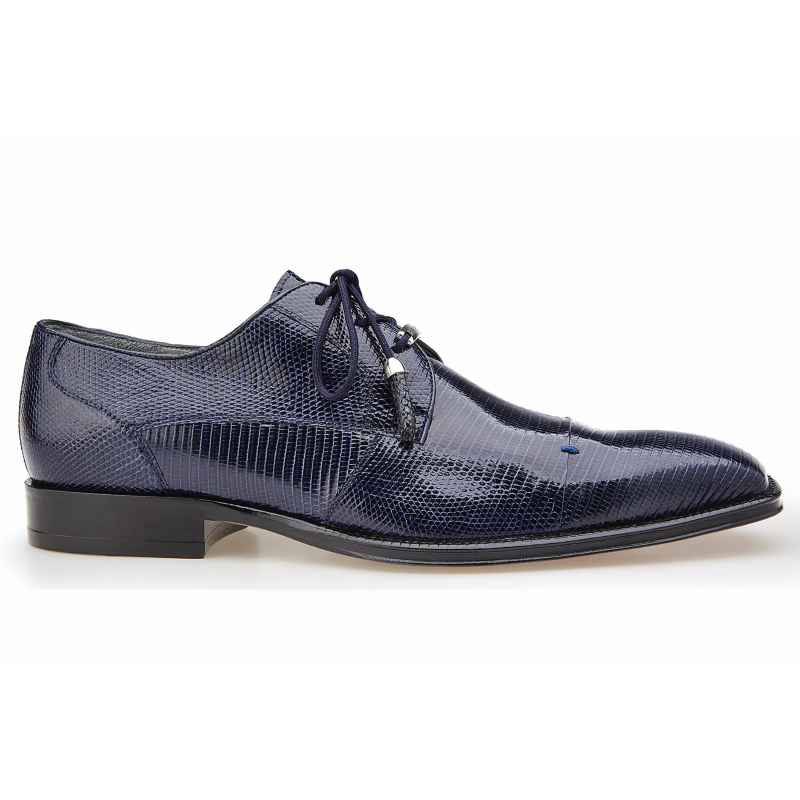 If you are looking for exotic men’s shoes, look no further than Belvedere. 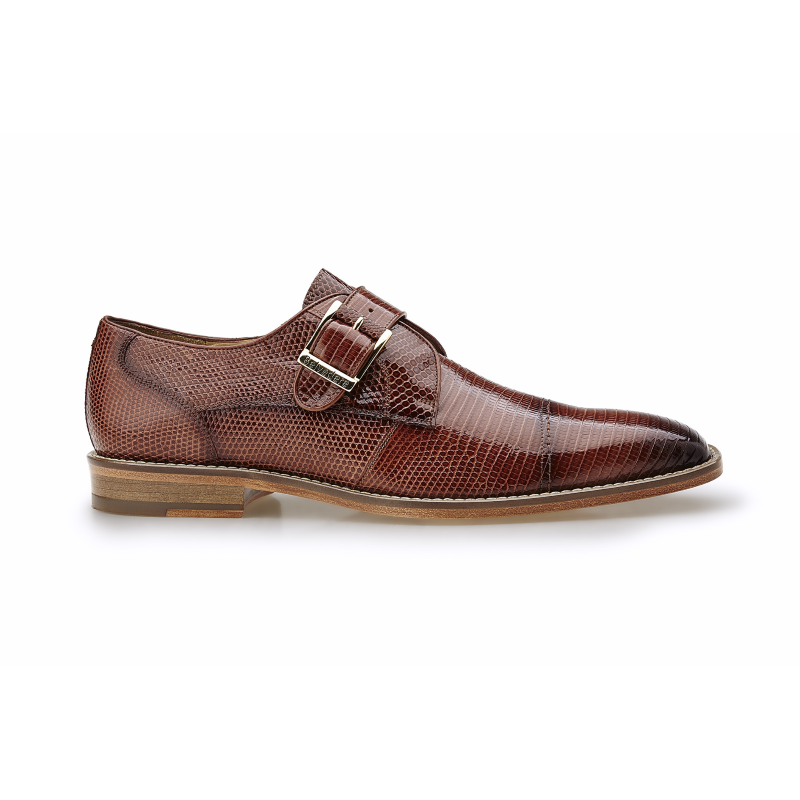 Since their launch in 1986, Belvedere shoes have established themselves as the leaders in the manufacture of men’s shoes made with exotic leathers. 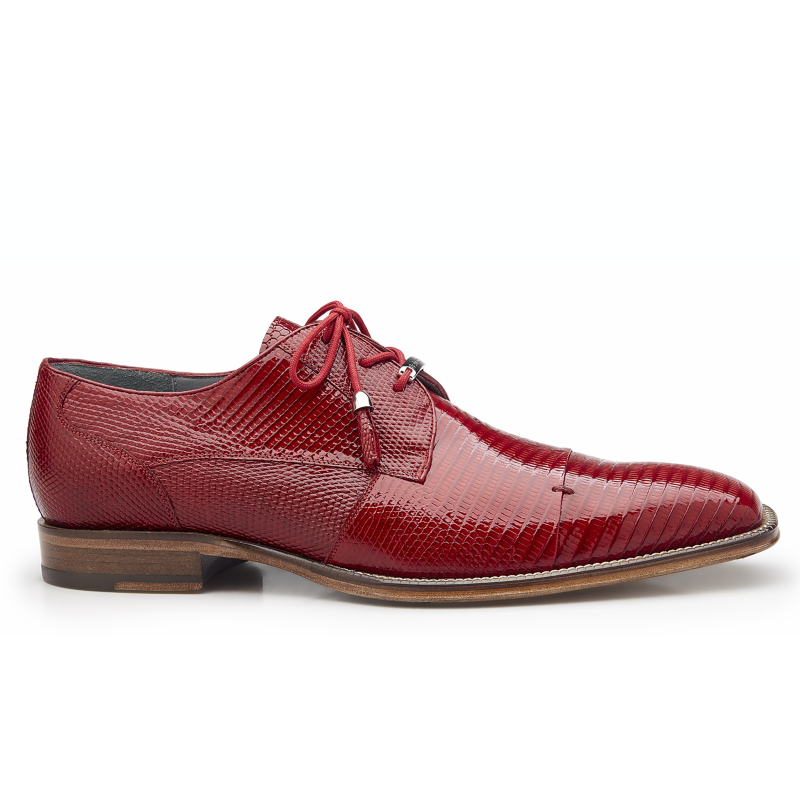 Their shoe collection today includes a mix of dress shoes (both lace up shoes and loafers), casual shoes (including sneakers), boots, slippers and sandals. 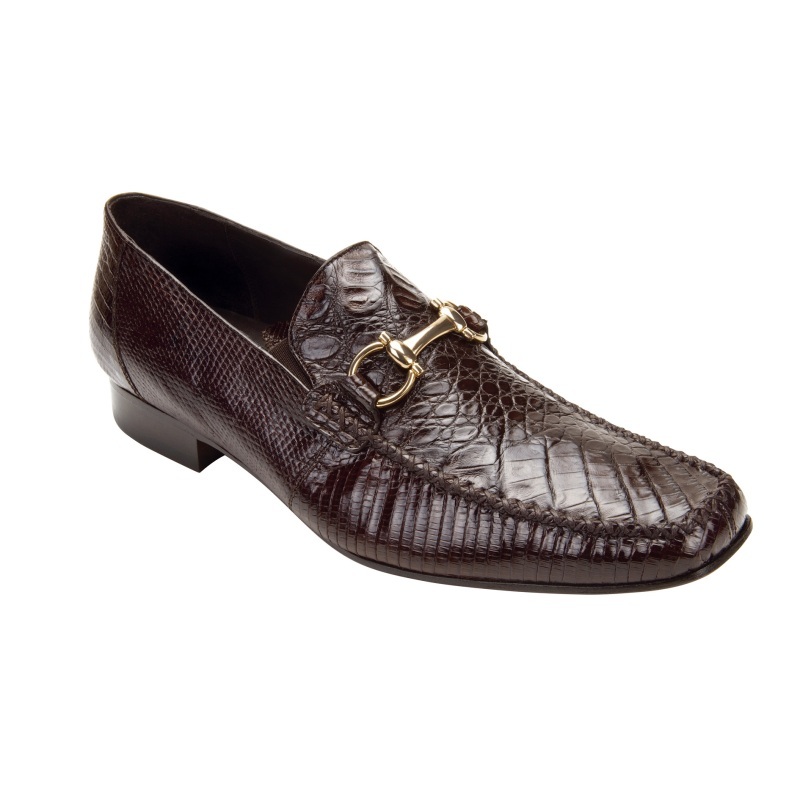 These shoes are made with premium leather such as crocodile, alligator, ostrich, lizard and shark. 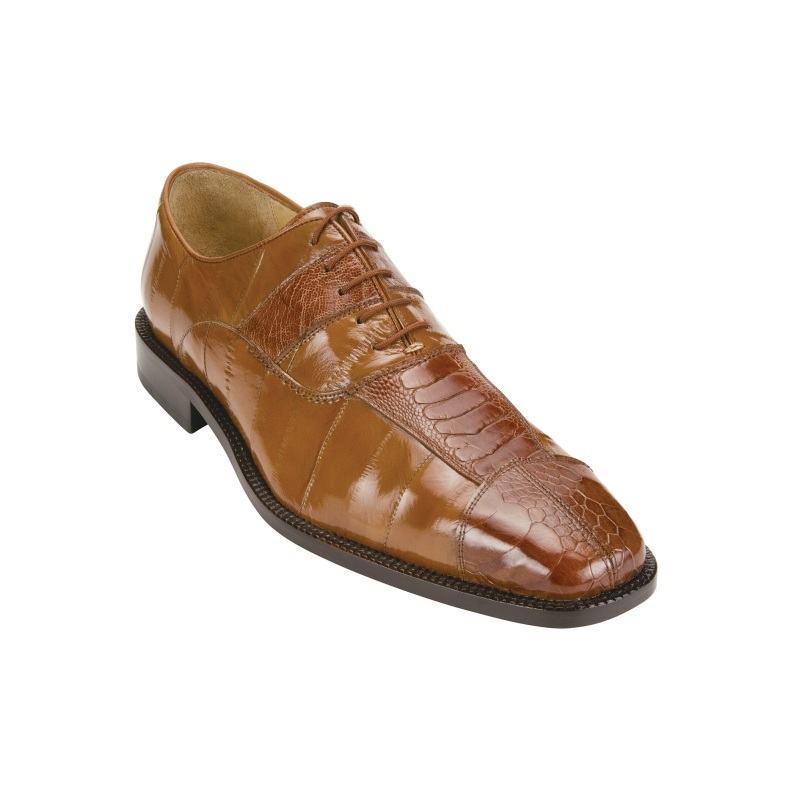 The Belvedere shoe catalog is a mix of classic styles that appeal to the regular customer and bold styles designed to draw attention. One of the most appealing factors of these shoes is the way classic design philosophies are blended with modern touches. 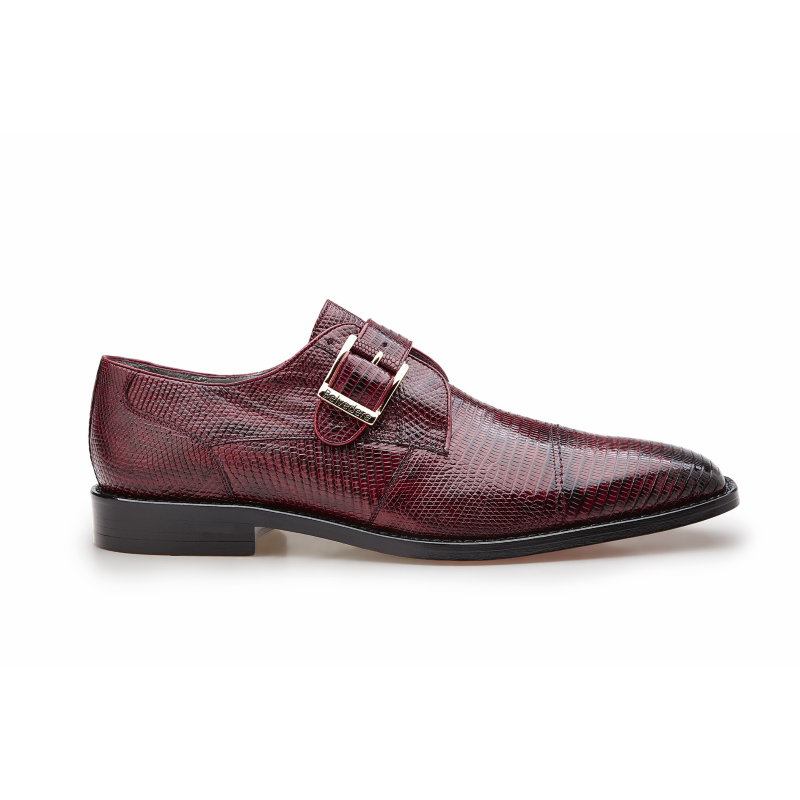 This is also evident in the way they quite effectively bring together multiple exotic leathers in a single pair of shoe. 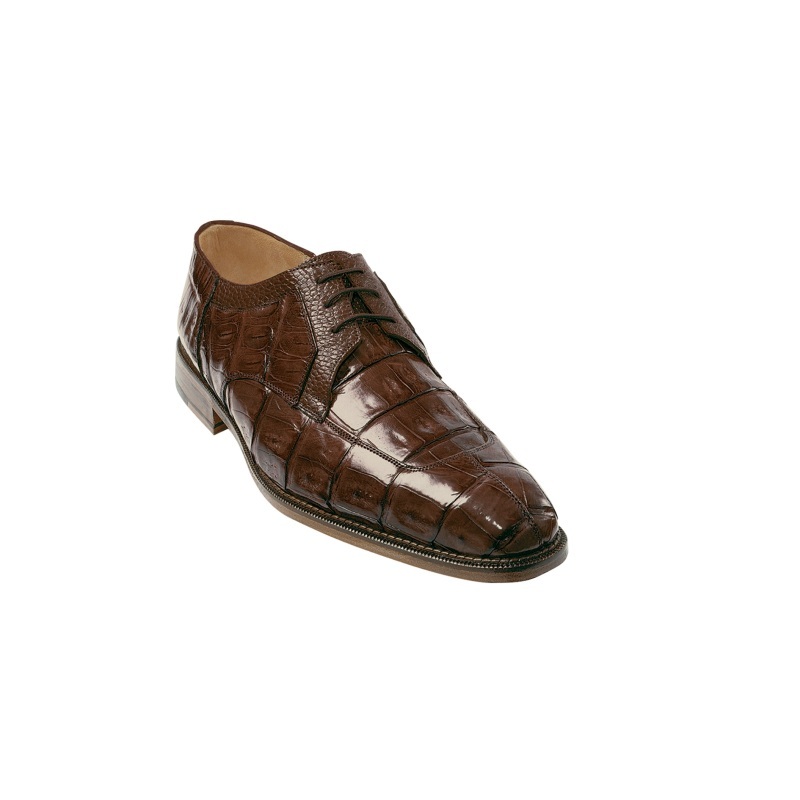 It is not uncommon to have a shoe that has both ostrich and crocodile skin. 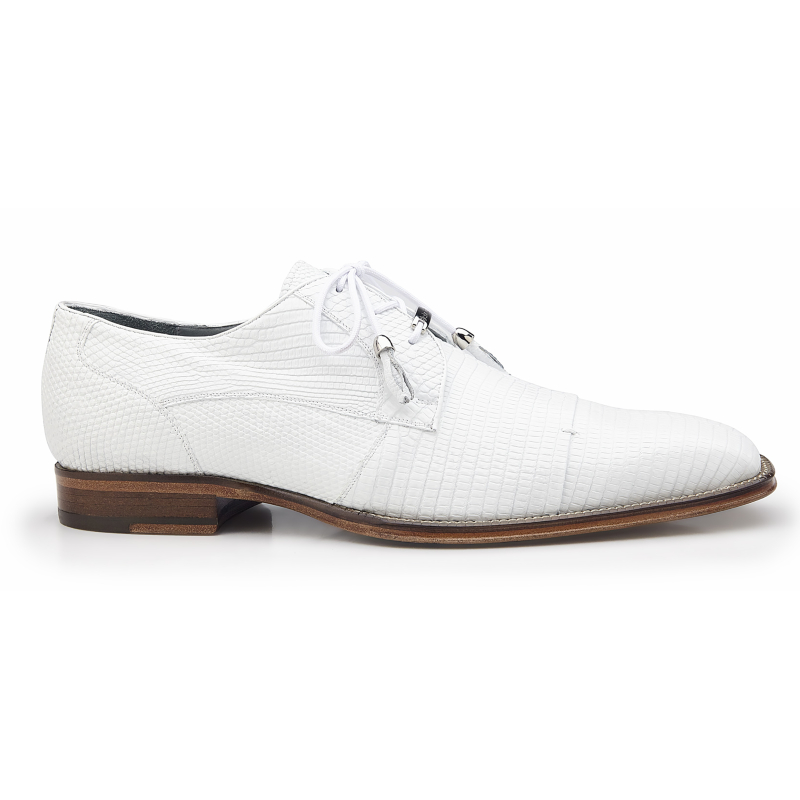 Not many brands have been able to pull this off as effectively as Belvedere does. 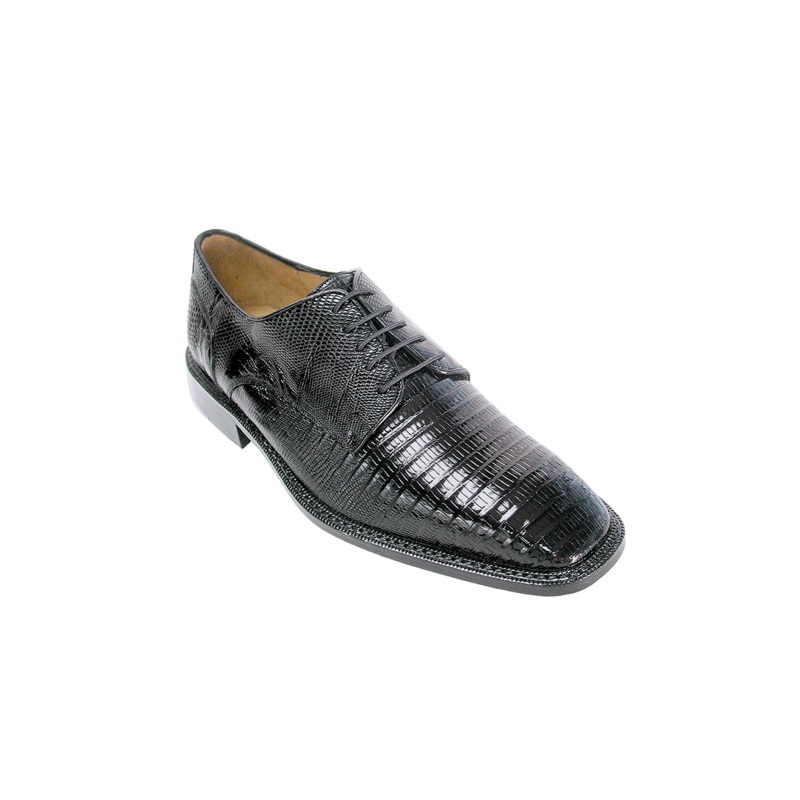 One thing that you can be rest assured of when it comes to Belvedere shoes is that they are made with genuine exotic leather of the highest quality. 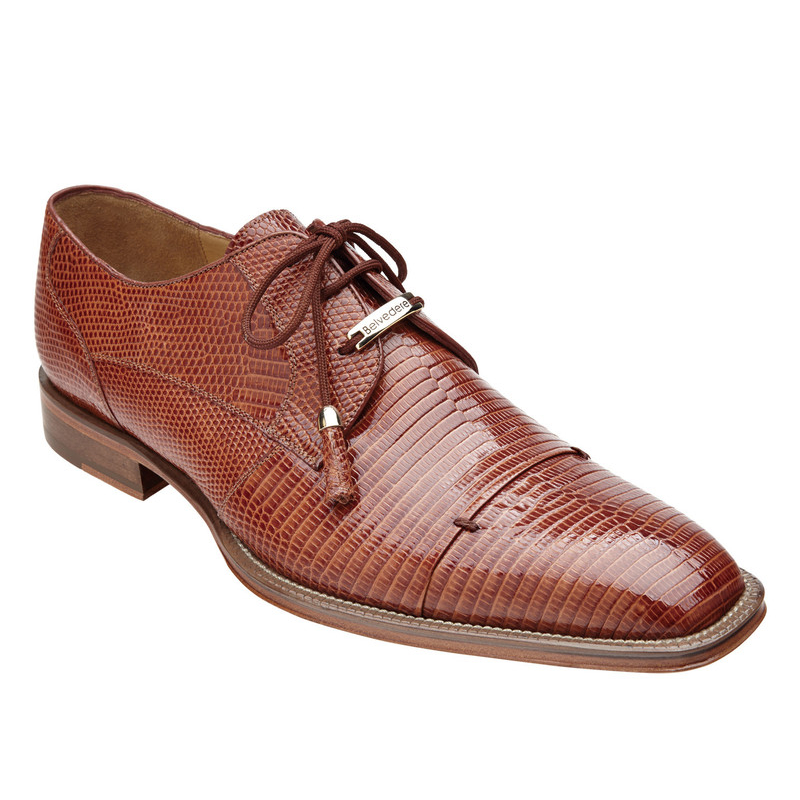 At the same time, these shoes cost lower than exotic leather shoes from other brands. 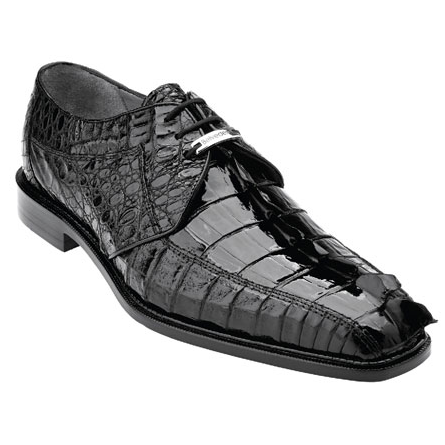 Typically, Crocodile shoes cost anywhere between $300 to $600 while alligator shoes are priced between $400 to $700. 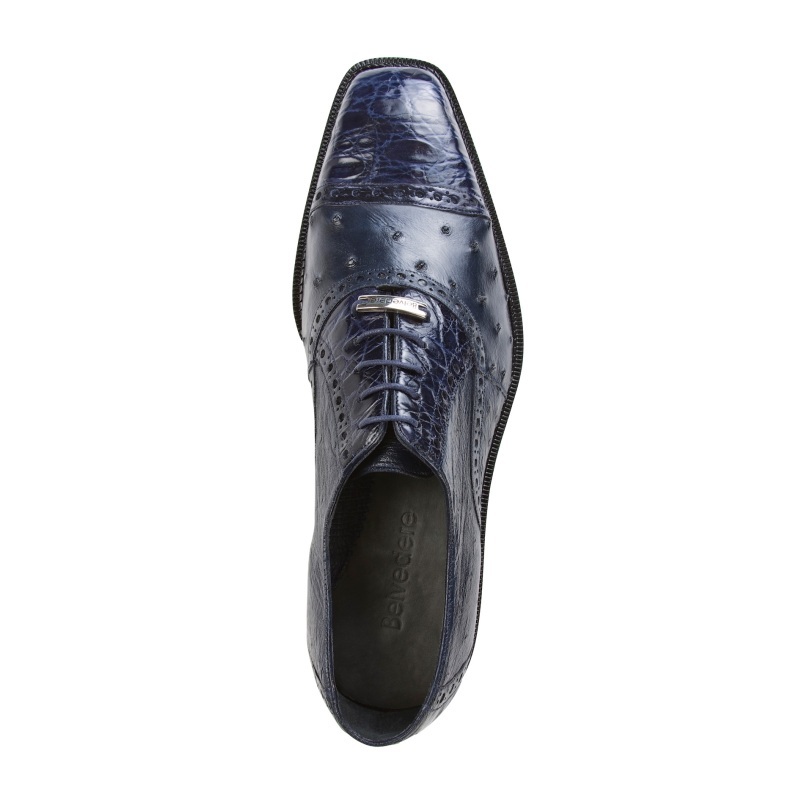 The prices of Ostrich shoes and Lizard shoes lie between $300-$550 and $300-$400 respectively. 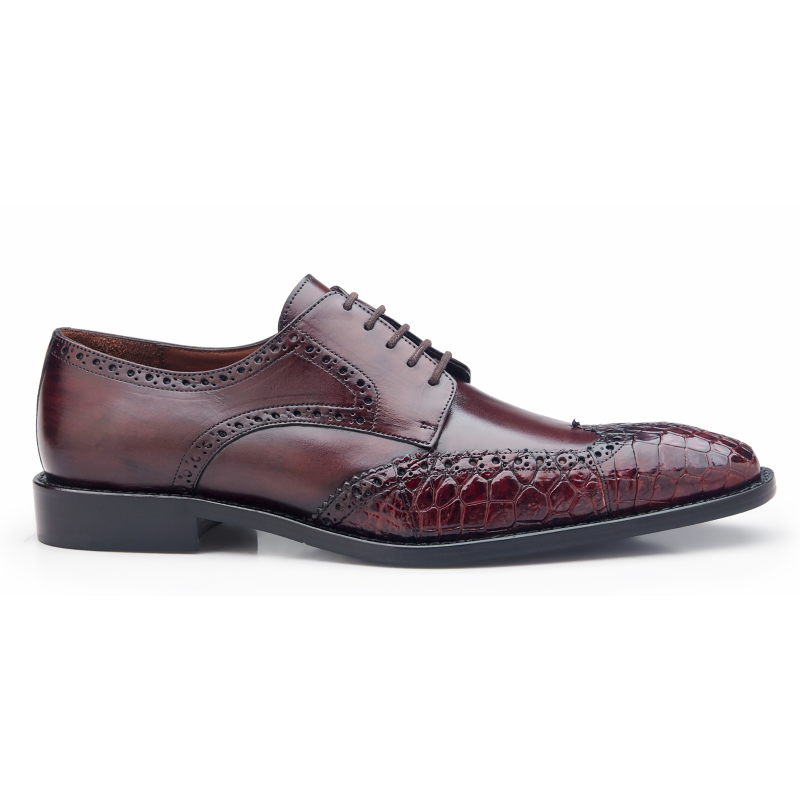 If you are looking for shoes made with exotic leather like crocodile or ostrich, Belvedere is not the only one. 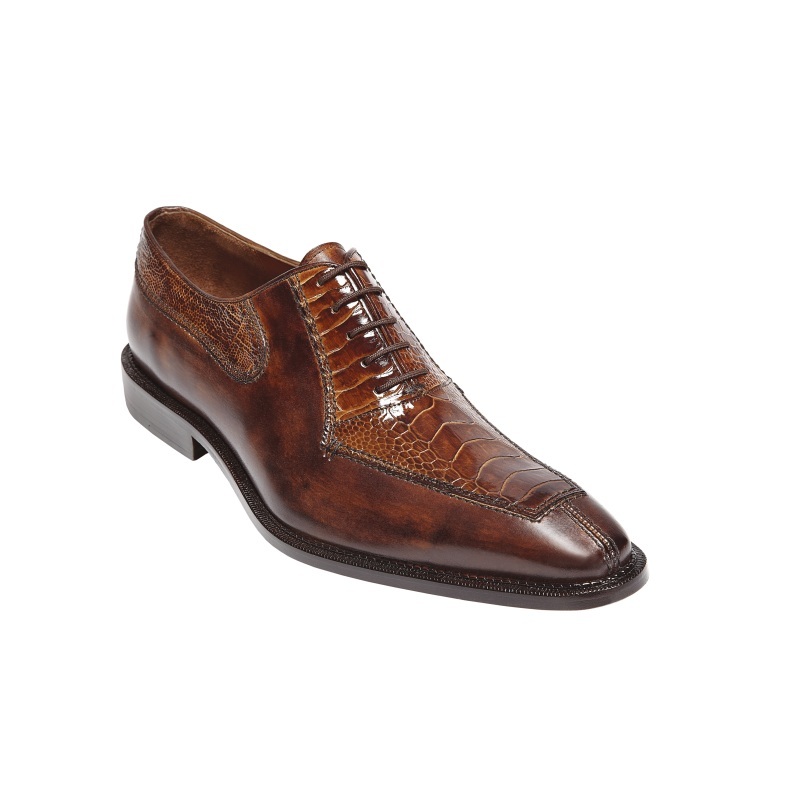 Mezlan, Los Altos and Mauri are a few other brands that you may check out. 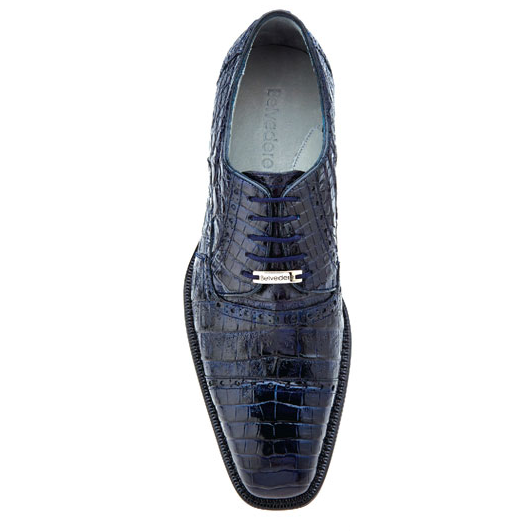 These brands have shoes made with the leather of crocodile, alligator, ostrich, camel and eel. 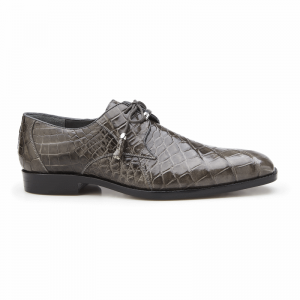 Alligator leather is extremely popular among customers looking for premium dress shoes as well as those who are interested in loafers, sneakers and boots. 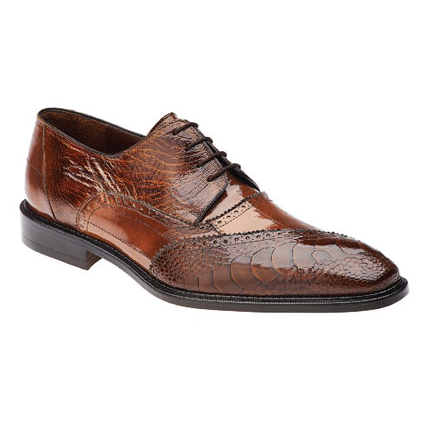 The most premium Alligator shoe in the collection today is the Belvedere Lago Alligator Dress shoes that is priced at $699 at the time of writing. 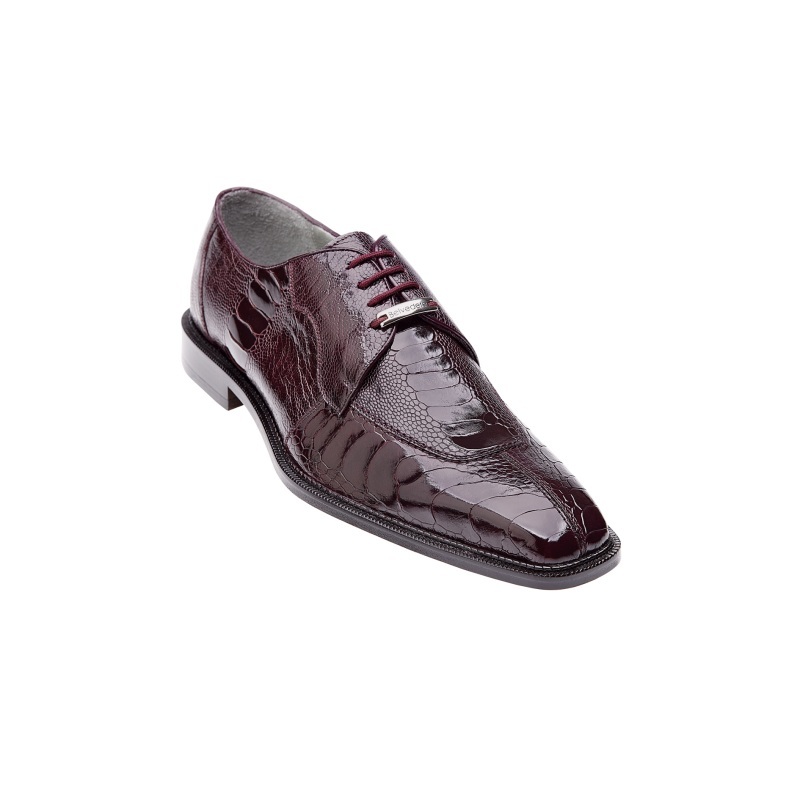 These shoes are available in a range of colors like black, cognac, gray and navy. 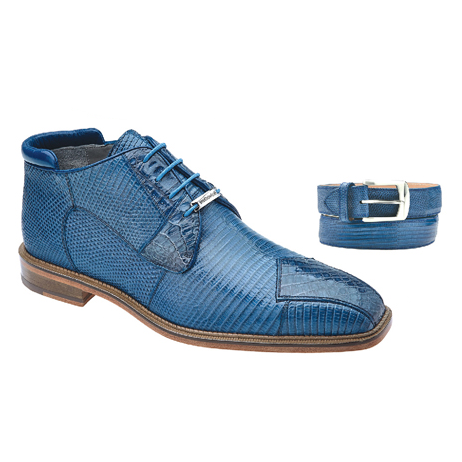 The Belvedere Libero Quilted Leather & Alligator Cap Toe boots is brilliantly made with stylish side zipper lace up and side buckle leather lining. 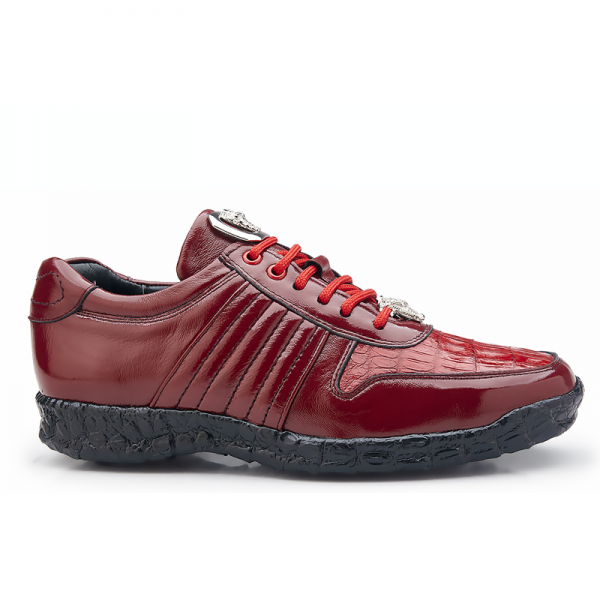 This is priced at $429 at the time of writing. 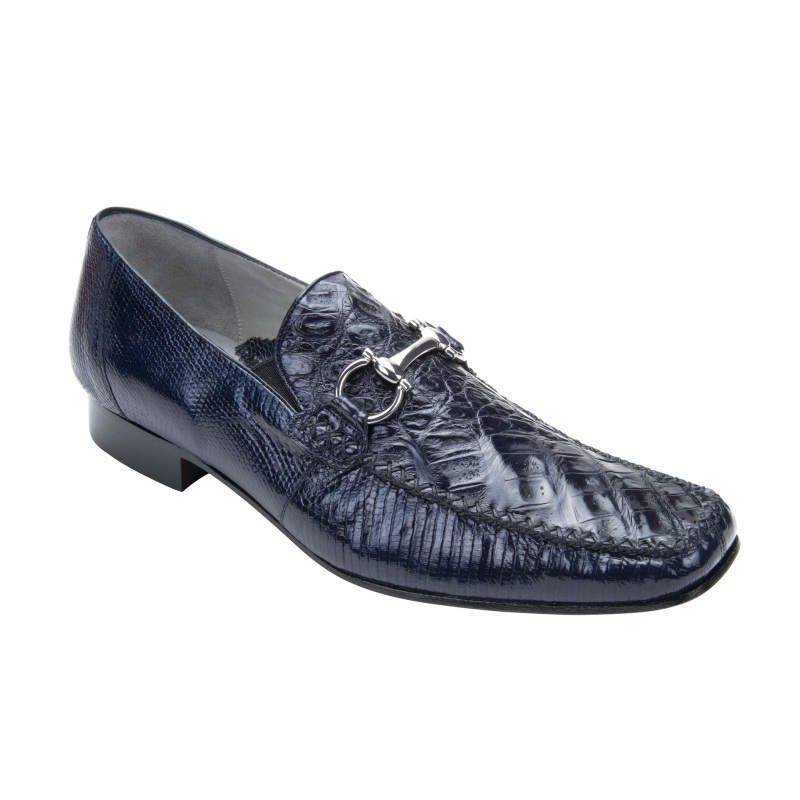 Customers who are fans of Belvedere’s masterful hybrid makes could check out the loafers from the Belvedere collection. 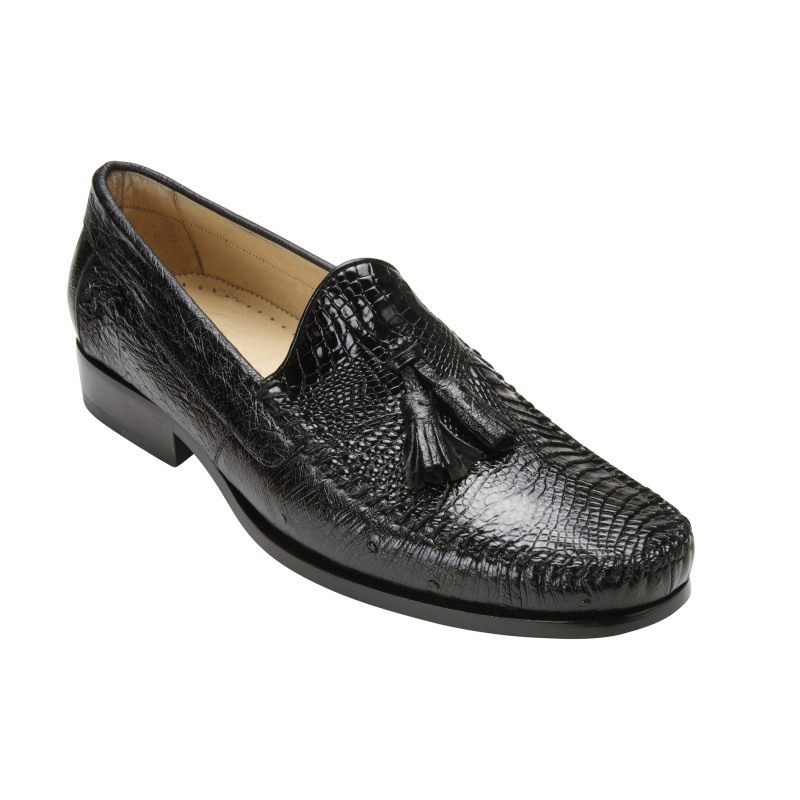 The Belvedere Plato Alligator & Calfskin bit loafers are available in black, dark burgundy and chocolate colors while the Belvedere Bari Caiman & Ostrich Tassel loafers are available in brown and black. 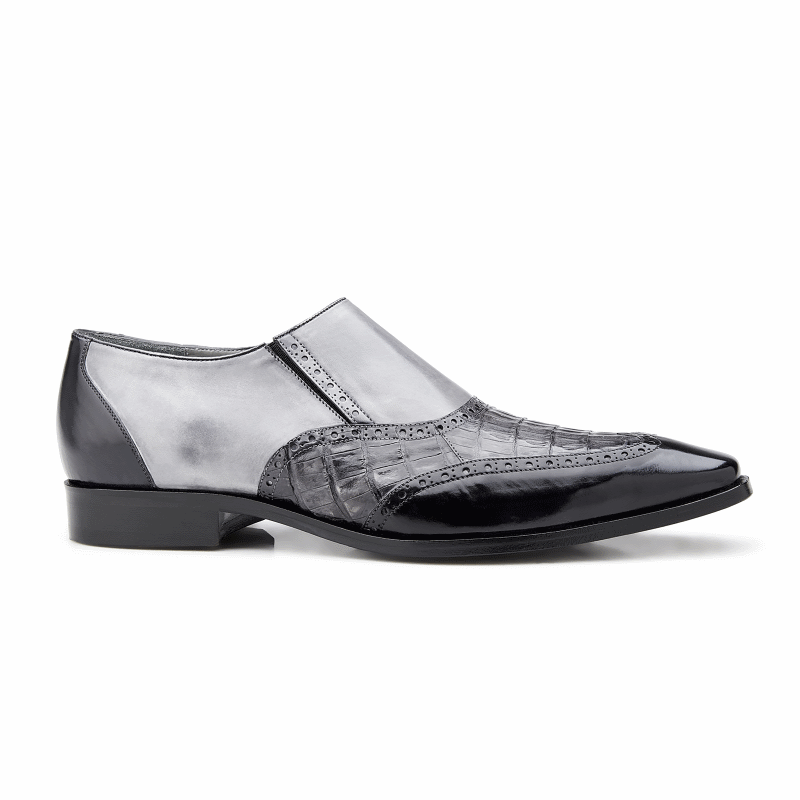 These loafers are priced under $399. 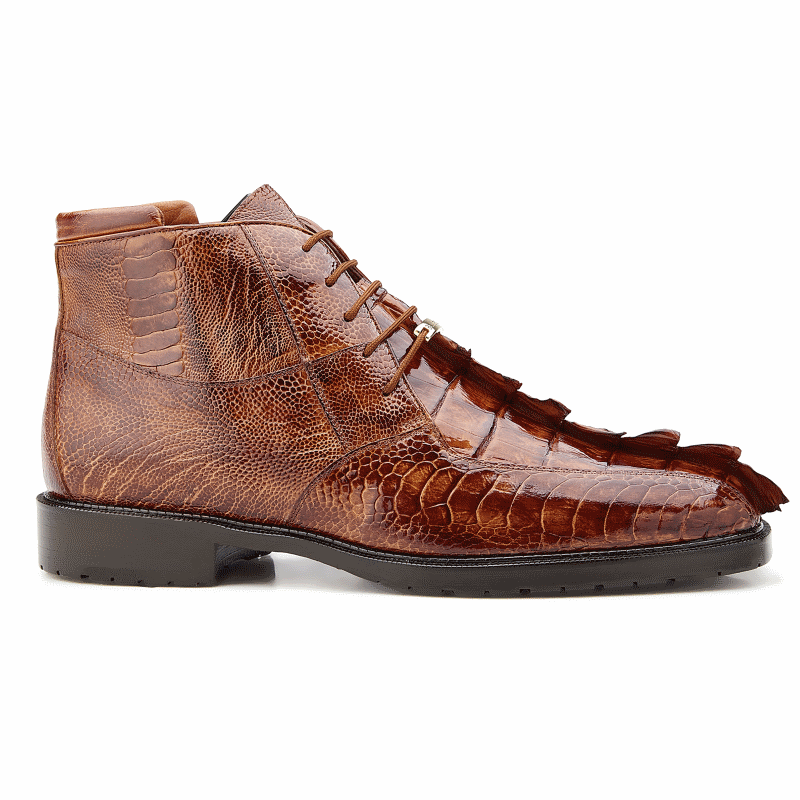 Fans of caiman leather may also check out the Belvedere Corona Lizard & Caiman sneakers that is available in dark brown/brown. 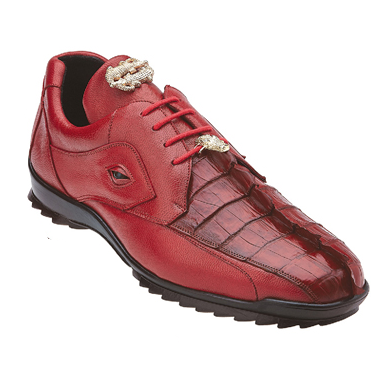 This is priced at $323 at the time of writing. There is a wide range of shoes, loafers, sneakers in the Belvedere shoe catalog. 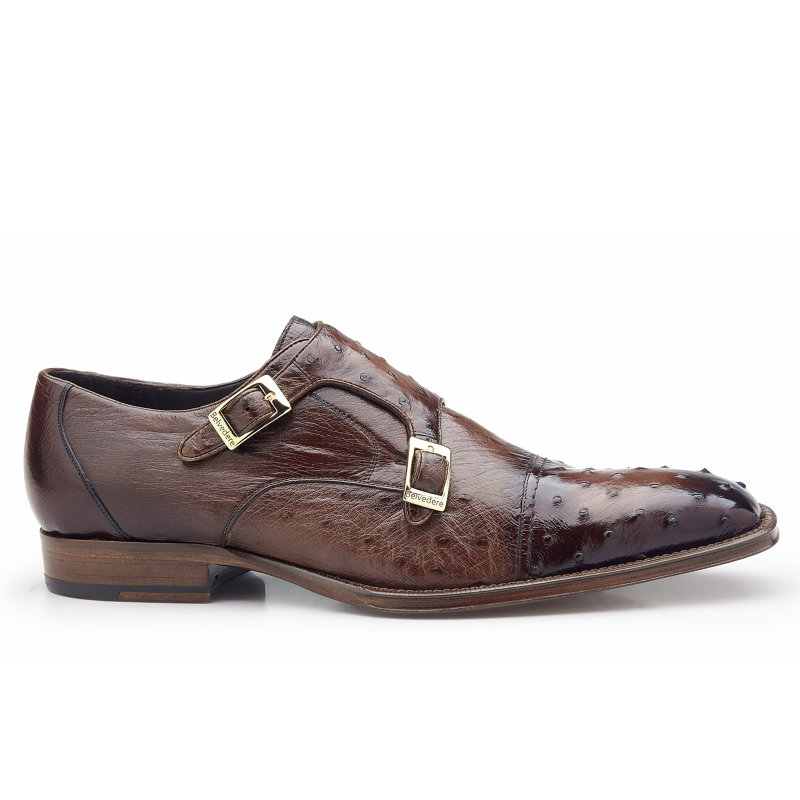 What we love about these shoes is not only that they bring together multiple exotic leathers, but also the wide range of stylish designs on offer. 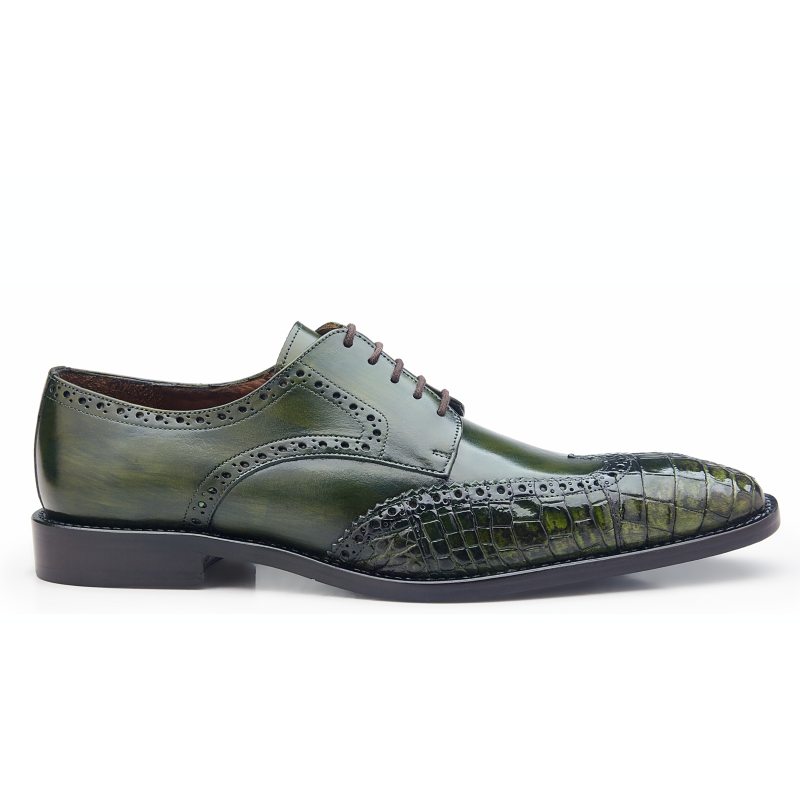 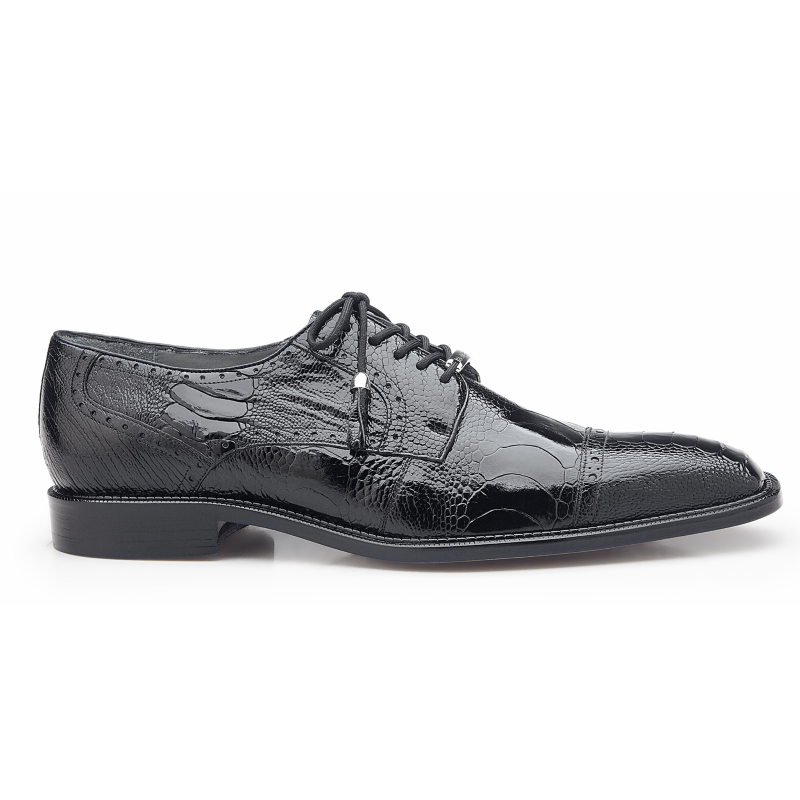 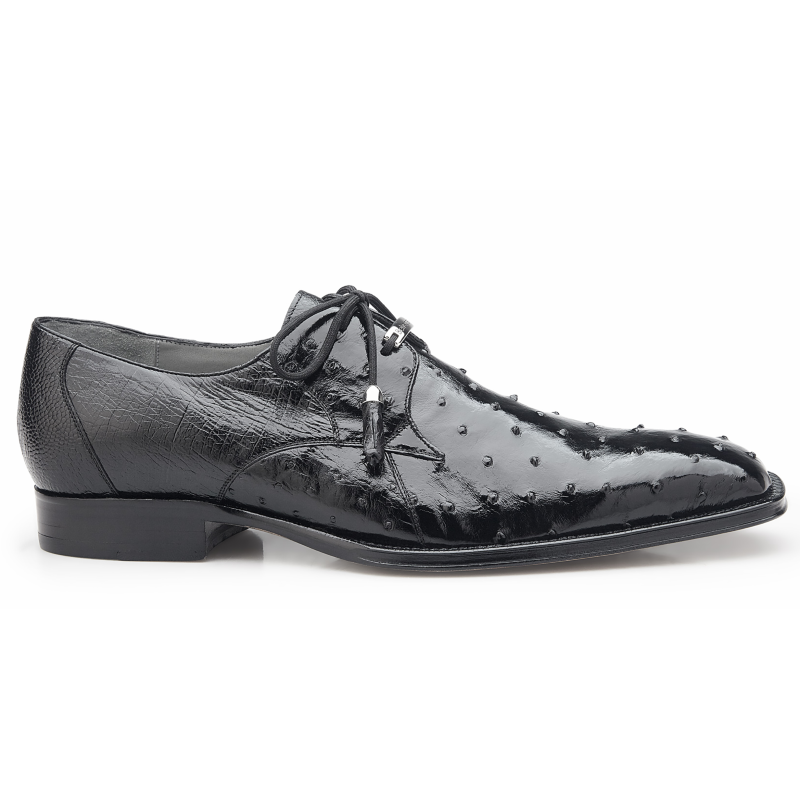 Take the Belvedere Lucas Crocodile & Calfskin Wingtip shoes for example. 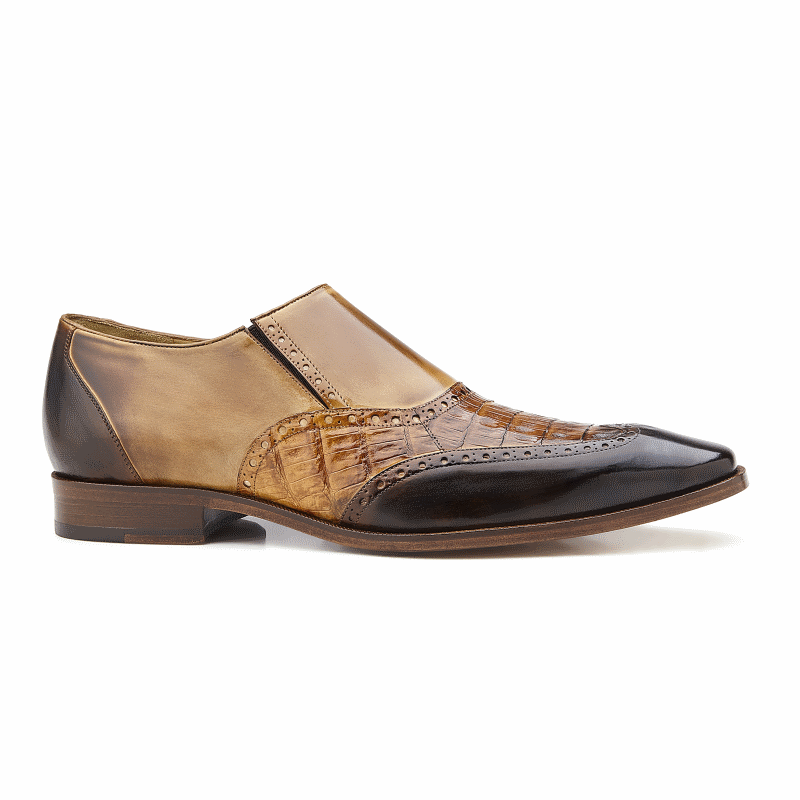 This features a stunning tri-tone of either dark-gray/gray/light-gray or brown/camel/tabac. 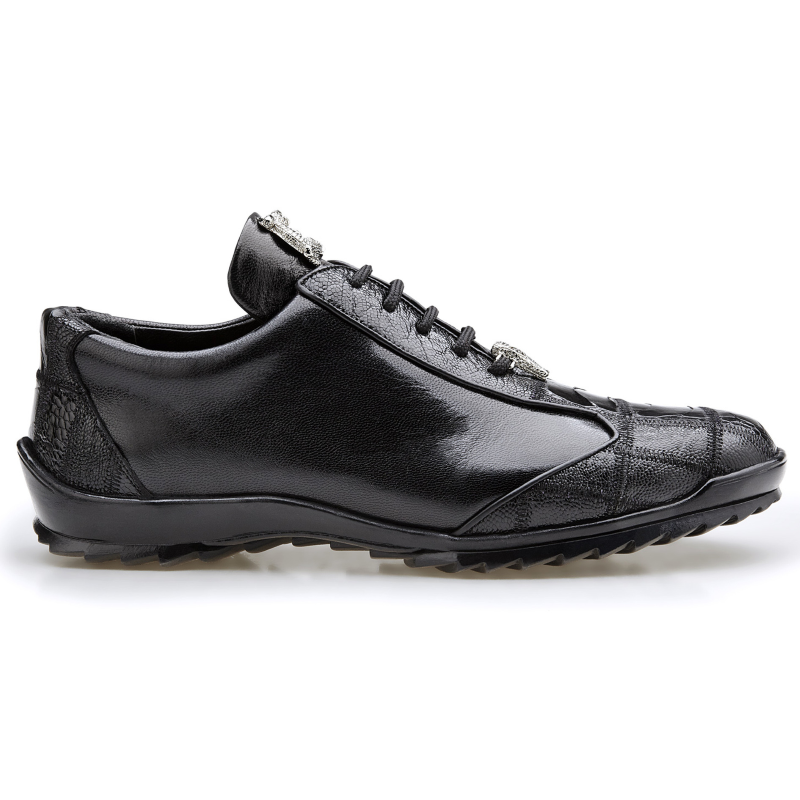 Another favorite of ours is the Belvedere Astor Calfskin & Crocodile sneakers that are made with the brand’s signature ornament leather lining and rubber sole. 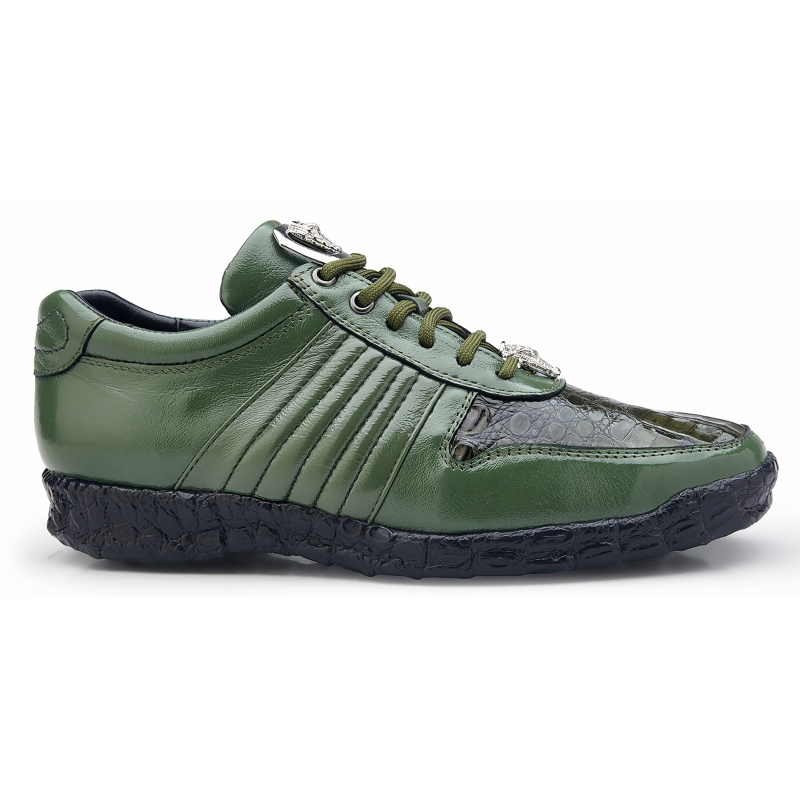 Besides the classic black and brown colors, these sneakers are also available in red, blue and olive colors. 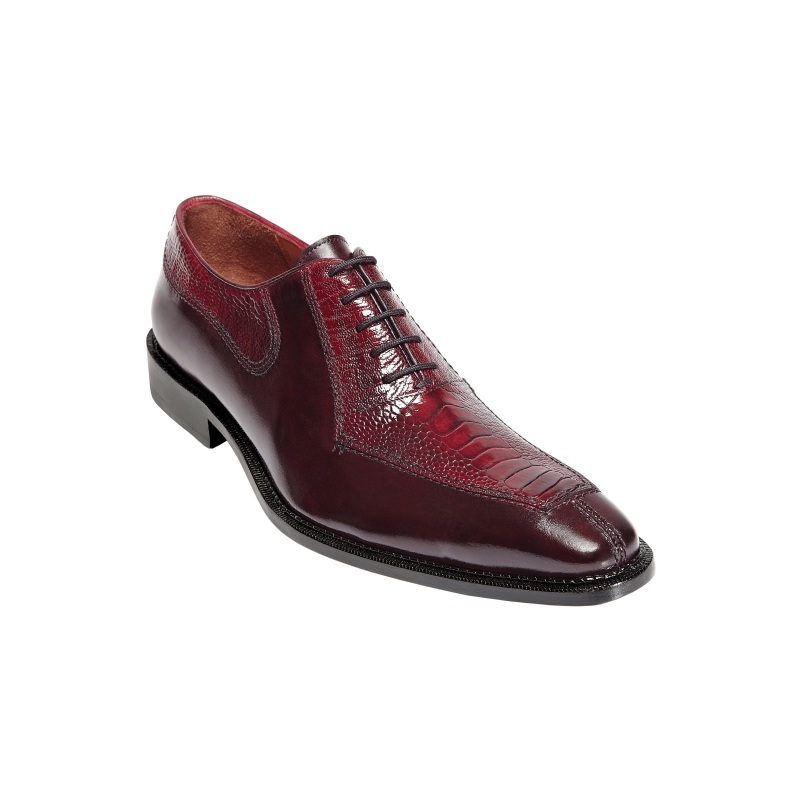 If you love such tasteful colors, you should also check out the Belvedere Urbano Crocodile & Calfskin Wingtip Shoes collection that is available in Emerald Safari, Wine Safari, or the Belvedere Alessio Crocodile & Calfskin Hi Top Sneakers that is available in red. 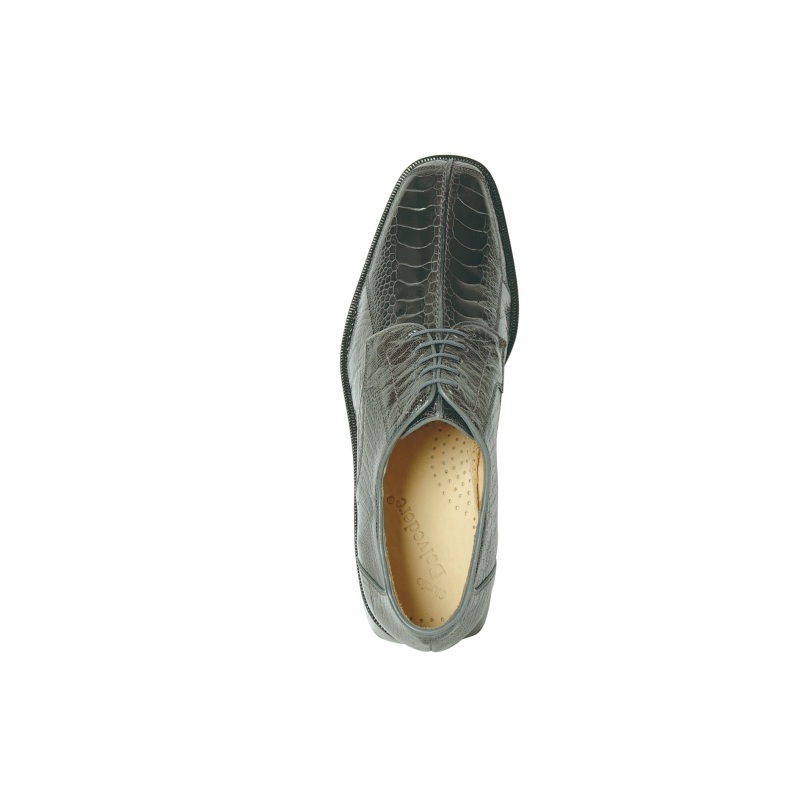 The Belvedere eel shoes are relatively more cost efficient and the price of these shoes range from anywhere between $239 to $349 at the time of writing. These shoes appeal to a wide diversity of customer tastes. 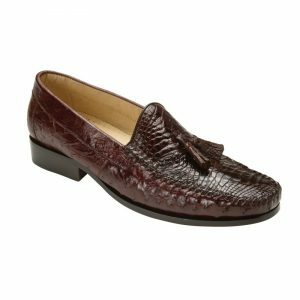 The Belvedere Nino Eel & Ostrich shoes are great for business occasions and come in black, antique red/scarlet and antique camel colors. 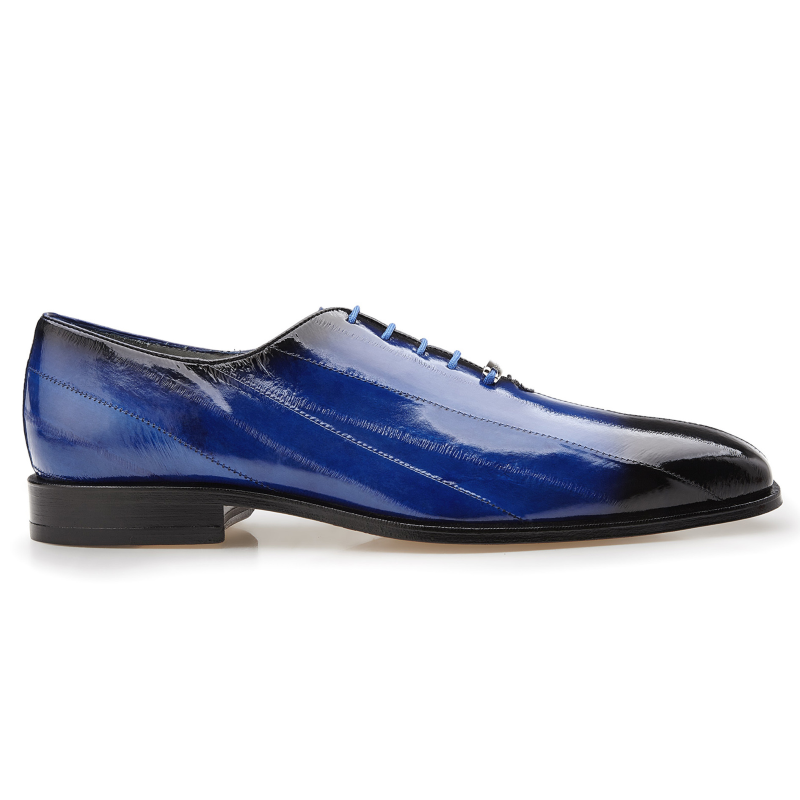 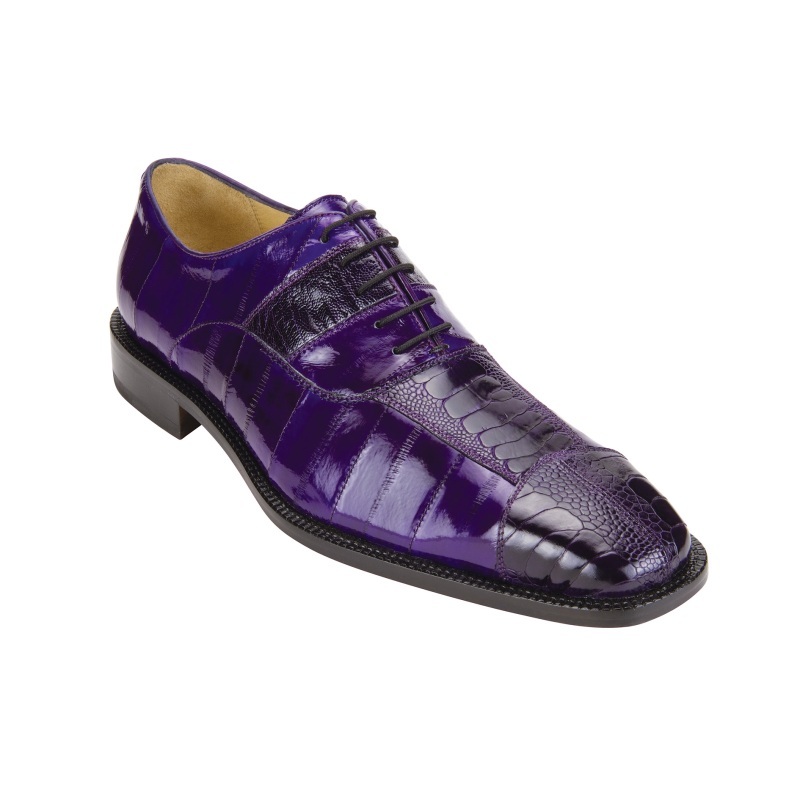 The Belvedere Mare Ostrich/Eel shoes, on the other hand, are more bold and come in trendy colors like purple and navy. 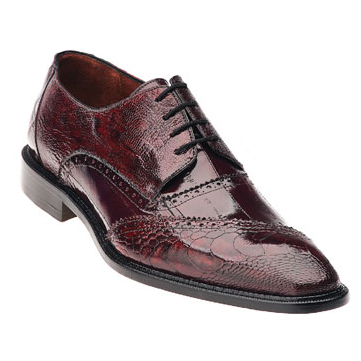 The Belvedere Vitale Eel & Calfskin High Top sneakers is one of our favorites and is priced at $239 and comes in a black/burgundy combo. 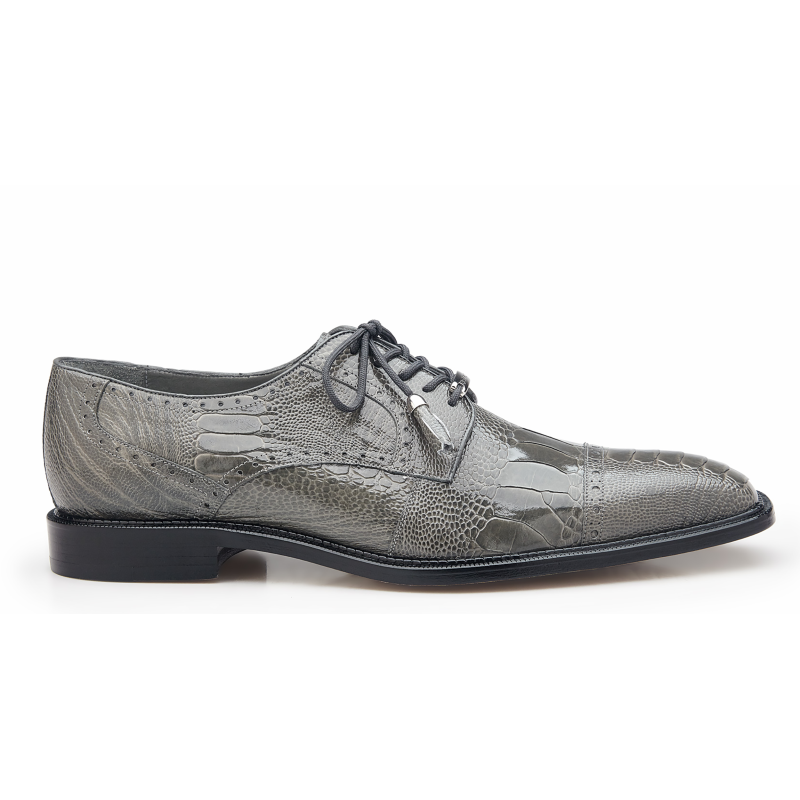 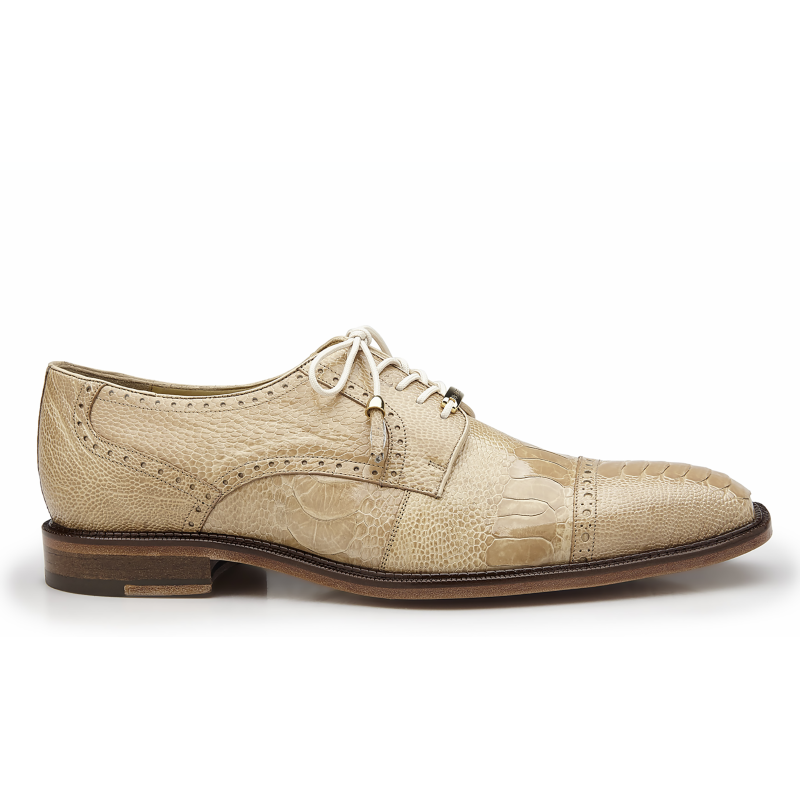 Belvedere shoes made with lizard leather are priced between $323 and $395. 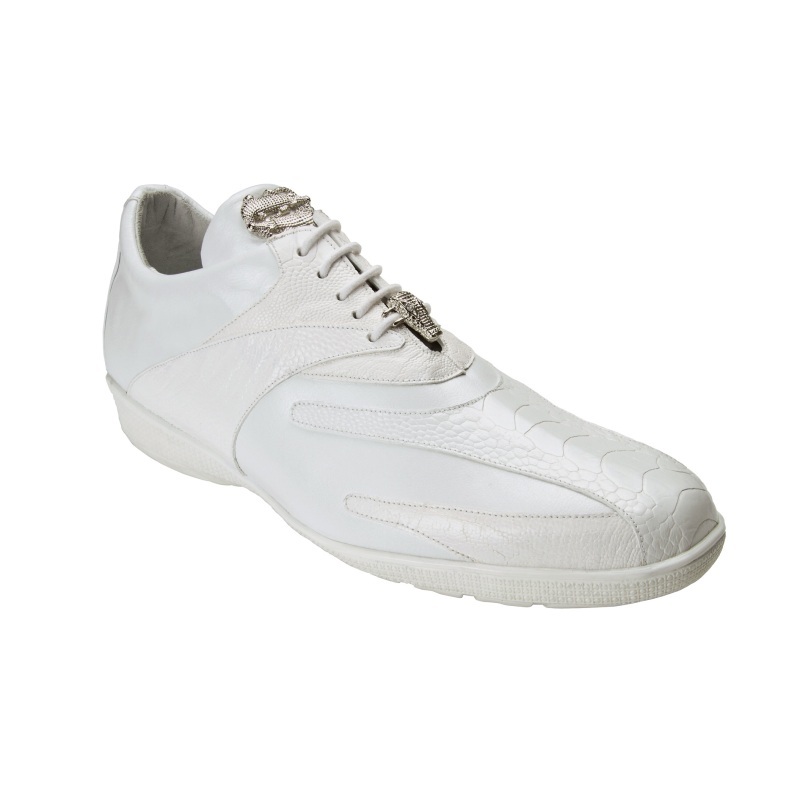 In this price range, you get a diverse mix of various types of shoes. 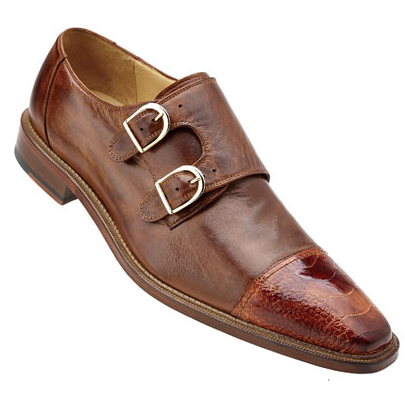 This includes strap shoes like the Belvedere Otto Lizard Monk Strap shoes that is priced $395 and is available in antique peanut antique navy, antique dark burgundy and black colors. 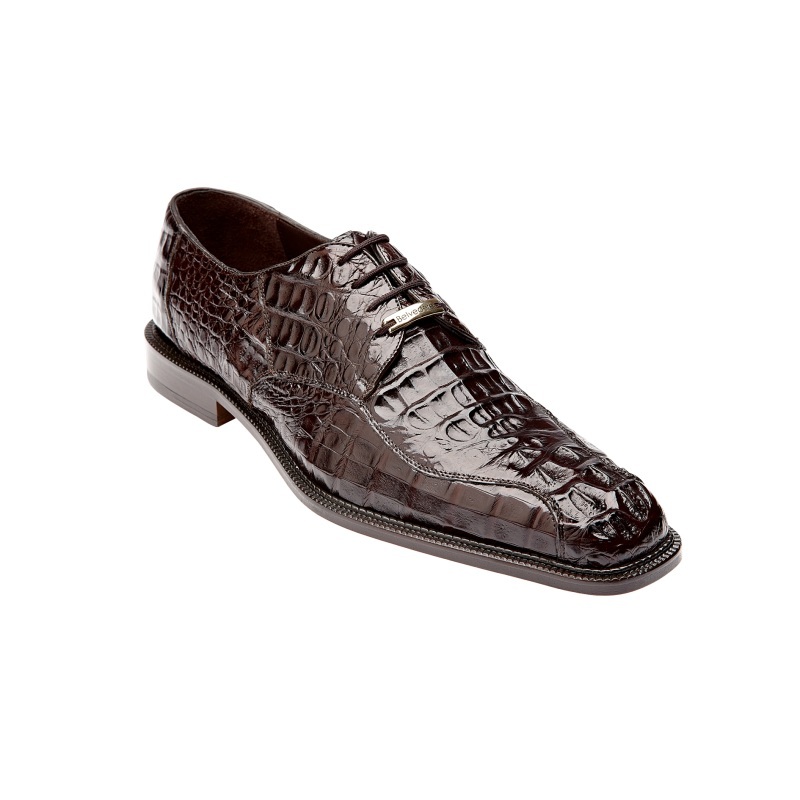 You also have sneakers like Belvedere Corona Lizard & Caiman and bit loafers like the Belvedere Italo Crocodile & Lizard. 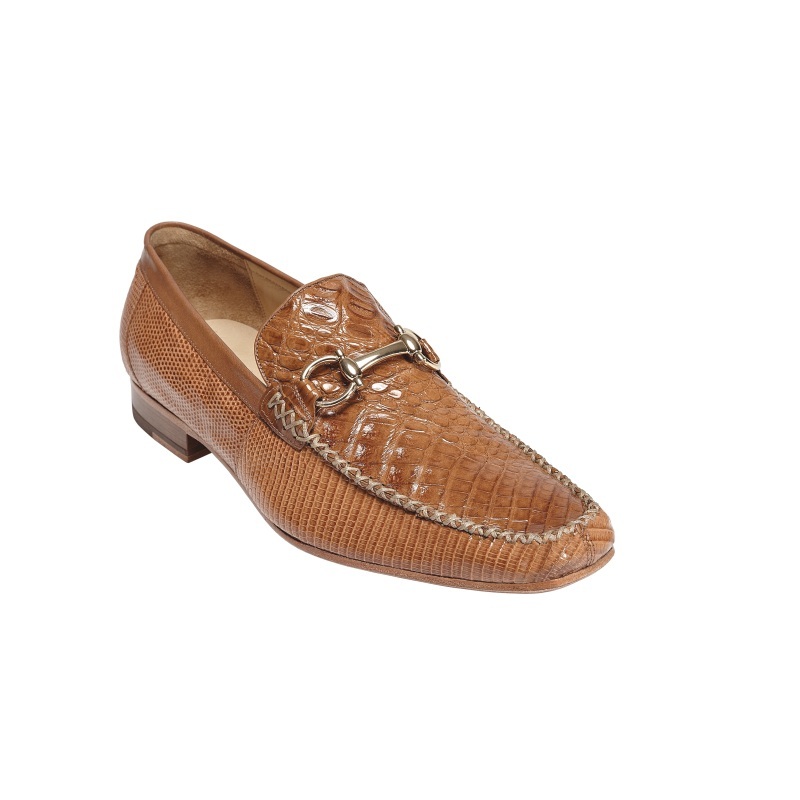 This is available in classic colors like Black, Brown and Navy colors. 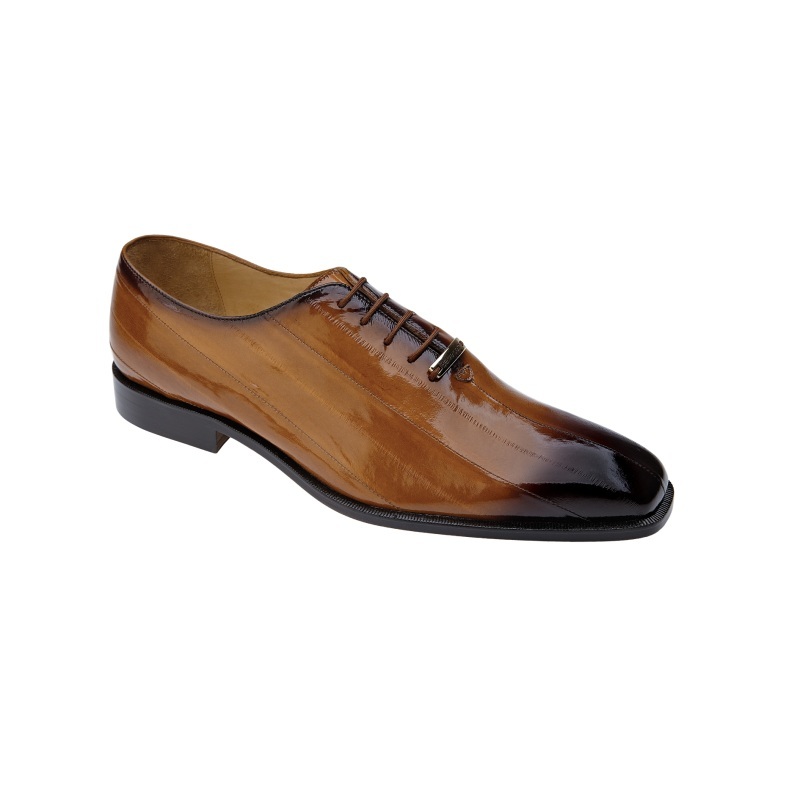 The Belvedere Karmelo Lizard cap toe shoes have the classic touch and come in black and tan colors. 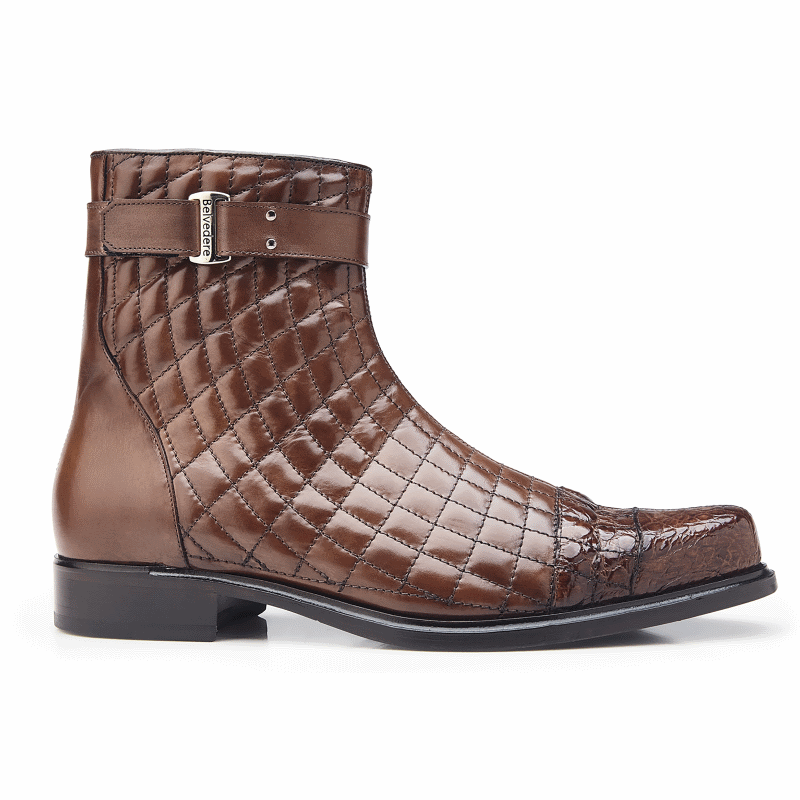 Shoes made with Ostrich leather have a pretty wide price range starting with the Belvedere Elio Calfskin & Ostrich High Top Sneakers at $279 to the Belvedere Barone Hornback & Ostrich Boots that are priced at $629. 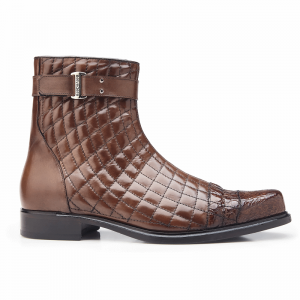 These high end boots come in the traditional black and brandy/antique brown colors as well as the more stylish ‘blue jean’ color. Customers looking for the business formal shoes may want to look at Belvedere Susa (in black, brown and navy colors) or at other options like Isola, Onesto II, Cotto and Siena. 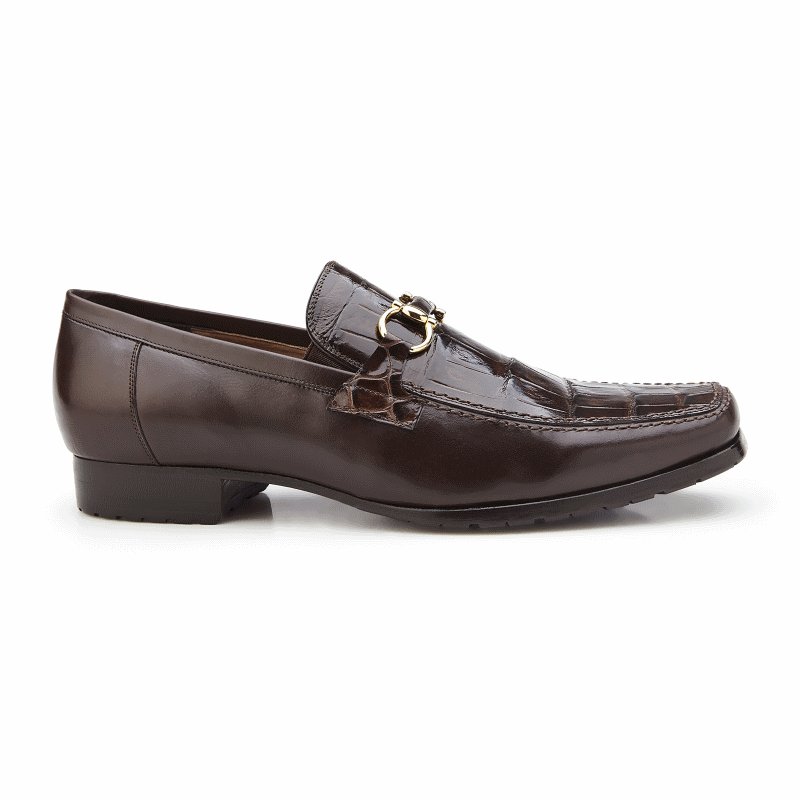 Each of these models come in the traditional black and brown colors that appeal to the traditionalists. 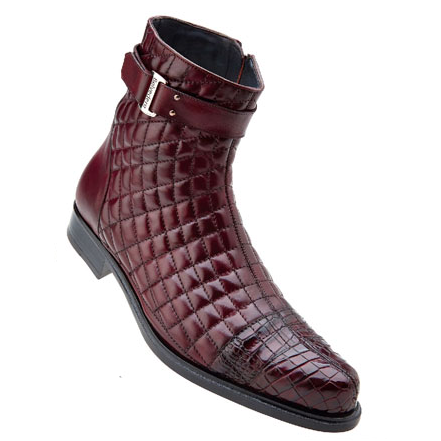 Those of you feeling adventurous should look at the purple colored Belvedere Mare Ostrich/Eel shoes or the cognac/white combo model of the Belvedere Elio Calfskin & Ostrich high top sneakers. 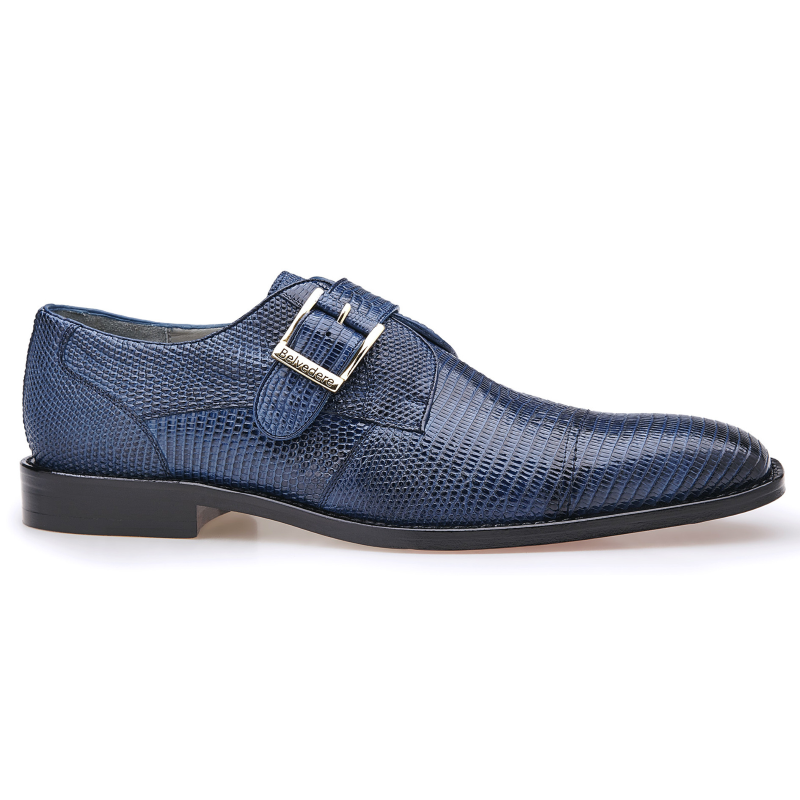 While Belvedere’s shoes are defined by the various exotic leathers they are made of, you may have also come to realize the sheer variety and types of footwear made by this brand. 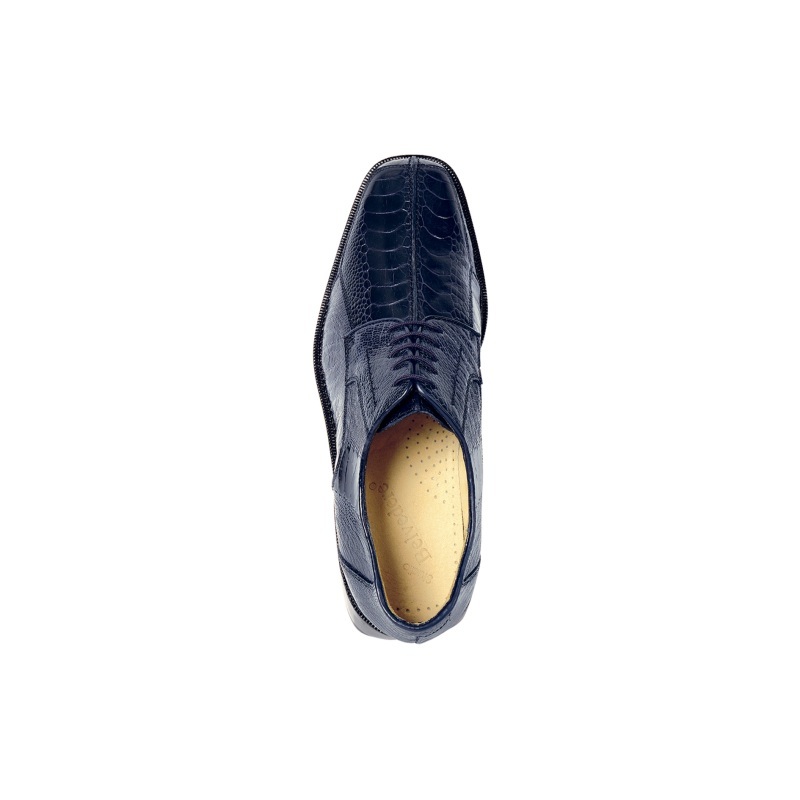 Here is a quick snapshot of the popular shoes categorized by type.